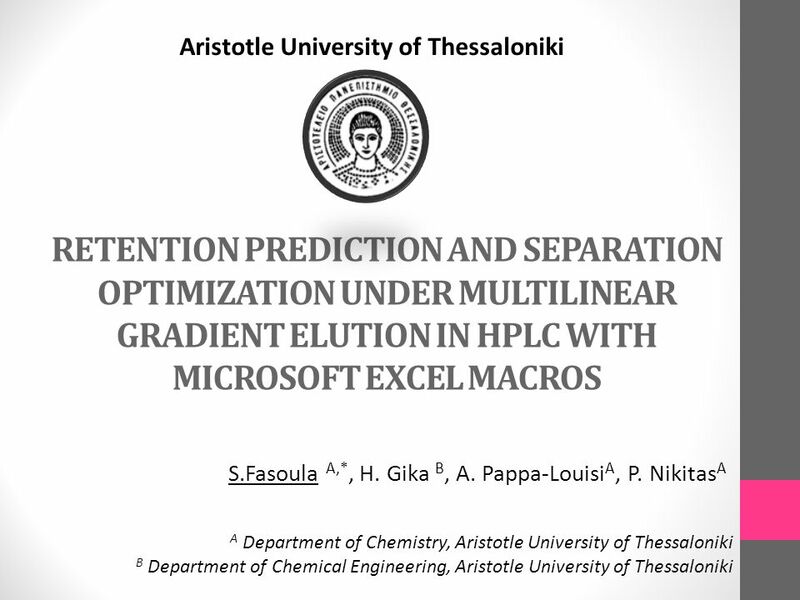 RETENTION PREDICTION AND SEPARATION OPTIMIZATION UNDER MULTILINEAR GRADIENT ELUTION IN HPLC WITH MICROSOFT EXCEL MACROS Aristotle University of Thessaloniki. 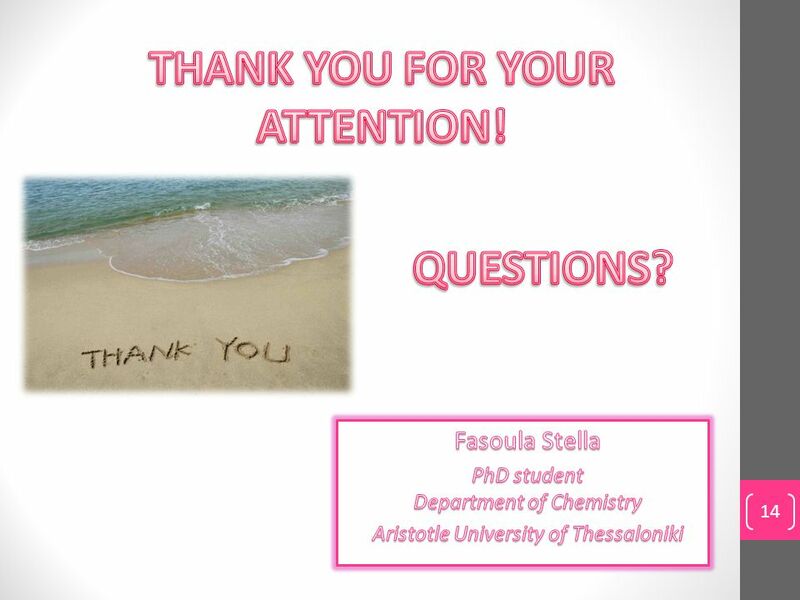 2 The aim Fasoula Stella, Aegean Analytical Chemistry Days 2014, Chios 2 The exploration of Excel 2010 or 2013 capabilities in the whole procedure of separation optimizations under multilinear gradient elution in HPLC Microsoft Excel : friendly computational environment application of systematic optimization strategies much easier for the majority of chromatographers The Excel versions up to 2007 did not equip with the proper optimization tool. 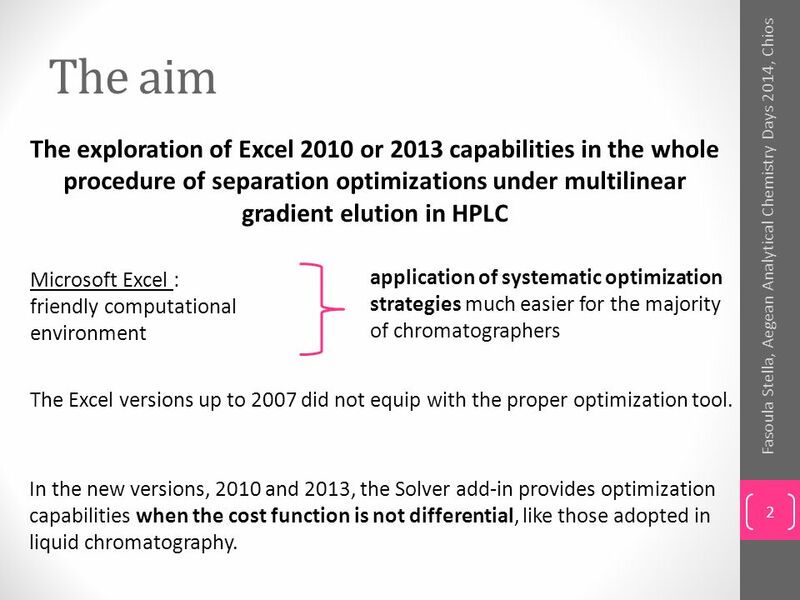 In the new versions, 2010 and 2013, the Solver add-in provides optimization capabilities when the cost function is not differential, like those adopted in liquid chromatography. 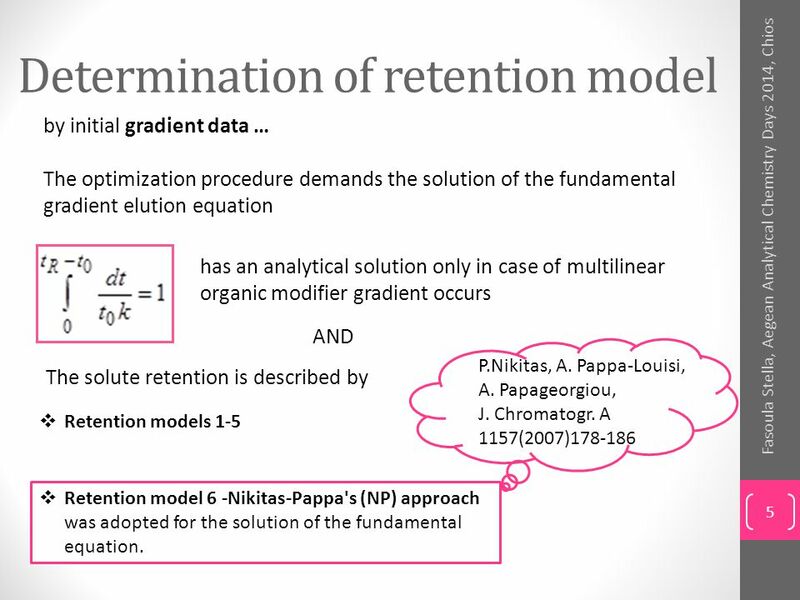 4 The retention models examined Fasoula Stella, Aegean Analytical Chemistry Days 2014, Chios 4 k solute retention factor, k=(t R -t 0 )/t 0 t R solute retention time t 0 column dead time φ is the organic modifier volume fraction c 0, c 1, c 2 are the adjustable parameters 1. 5. 6. 4. 3. 2. 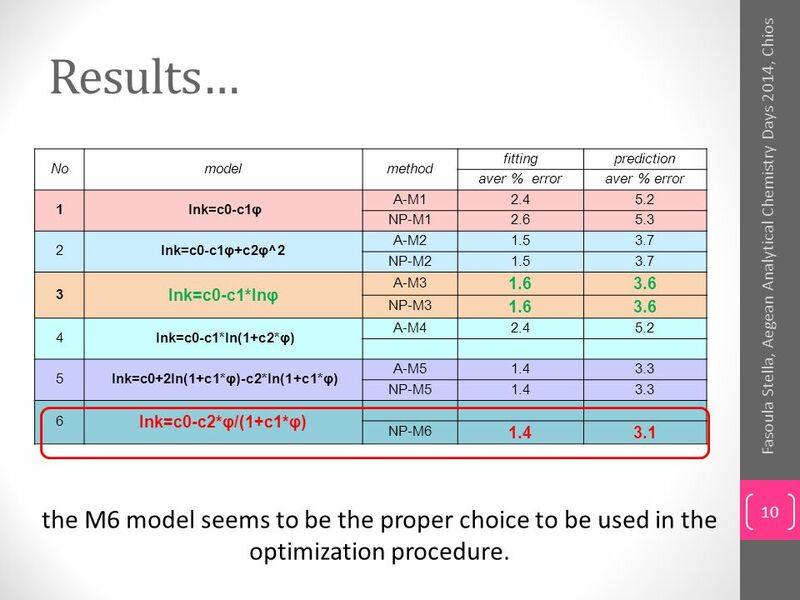 10 Results… Fasoula Stella, Aegean Analytical Chemistry Days 2014, Chios 10 Nomodelmethod fittingprediction aver % error 1 lnk=c0-c1φ A-M12.45.2 NP-M12.65.3 2lnk=c0-c1φ+c2φ^2 A-M21.53.7 NP-M21.53.7 3 lnk=c0-c1*lnφ A-M3 1.63.6 NP-M3 1.63.6 4 lnk=c0-c1*ln(1+c2*φ) A-M42.45.2 5 lnk=c0+2ln(1+c1*φ)-c2*ln(1+c1*φ) A-M51.43.3 NP-M51.43.3 6 lnk=c0-c2*φ/(1+c1*φ) NP-M6 1.43.1 the M6 model seems to be the proper choice to be used in the optimization procedure. 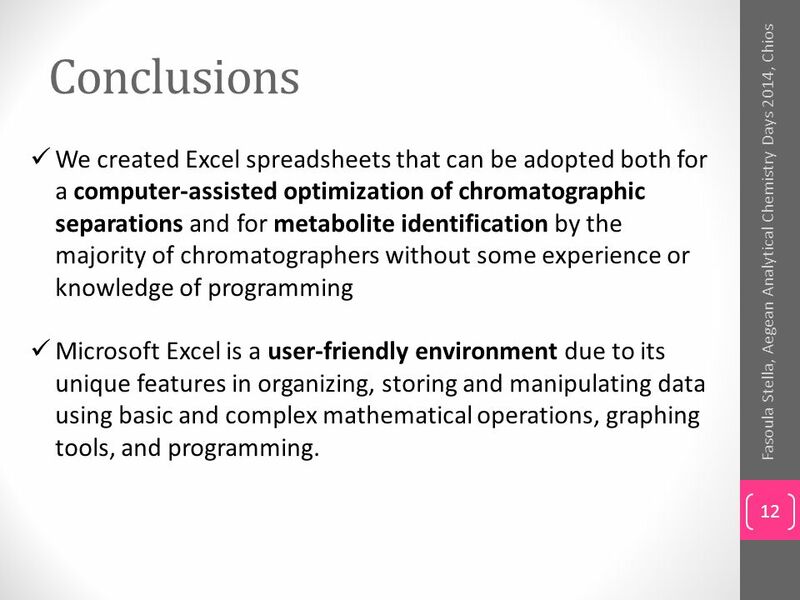 12 Conclusions Fasoula Stella, Aegean Analytical Chemistry Days 2014, Chios 12 We created Excel spreadsheets that can be adopted both for a computer-assisted optimization of chromatographic separations and for metabolite identification by the majority of chromatographers without some experience or knowledge of programming Microsoft Excel is a user-friendly environment due to its unique features in organizing, storing and manipulating data using basic and complex mathematical operations, graphing tools, and programming. 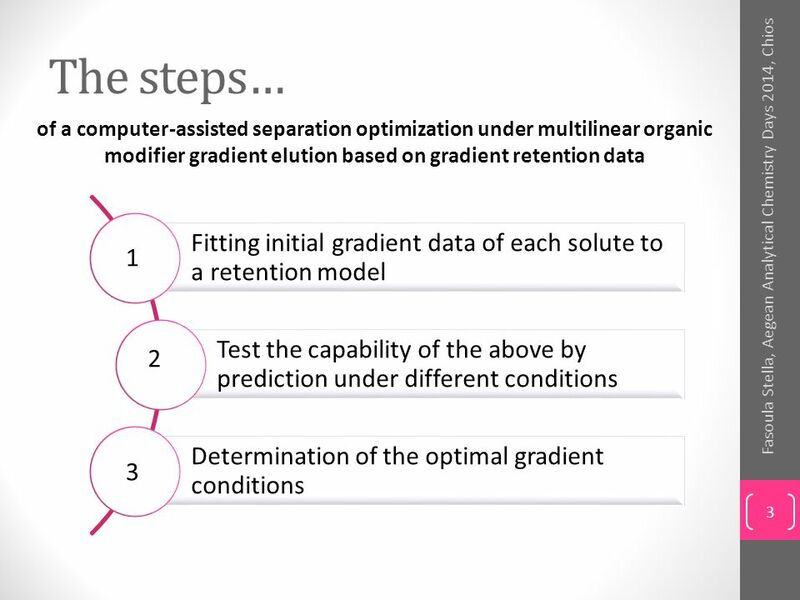 Download ppt "RETENTION PREDICTION AND SEPARATION OPTIMIZATION UNDER MULTILINEAR GRADIENT ELUTION IN HPLC WITH MICROSOFT EXCEL MACROS Aristotle University of Thessaloniki." Process Control: Designing Process and Control Systems for Dynamic Performance Chapter 6. 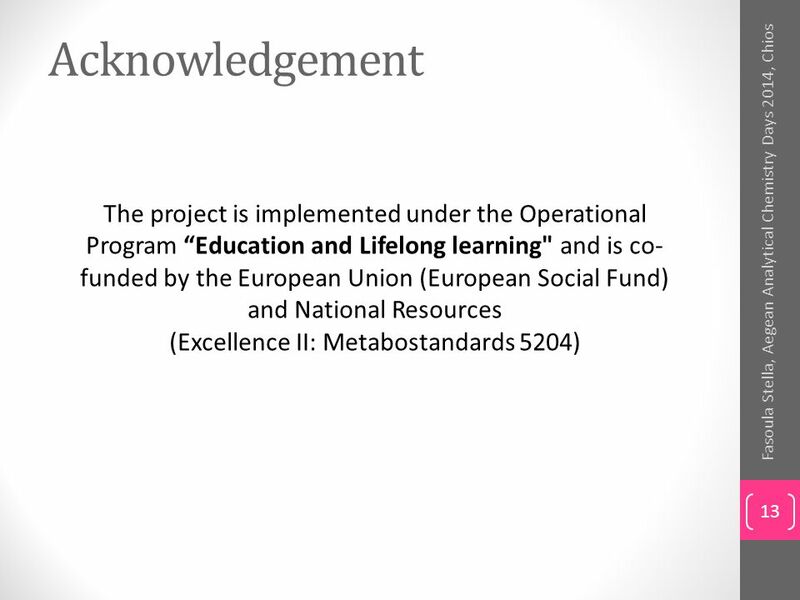 Empirical Model Identification Copyright © Thomas Marlin 2013. Section 6.1 Cauchy-Euler Equation. THE CAUCHY-EULER EQUATION Any linear differential equation of the from where a n,..., a 0 are constants, is said to. CHEE 311Lecture 161 Correlation of Liquid Phase Data SVNA 12.1 Purpose of this lecture: To show how activity coefficients can be calculated by means of. Superresolution Chromatography E.L.Kosarev - P.L.Kapitza Institute for Physical Problems, RAS K.O.Muranov. 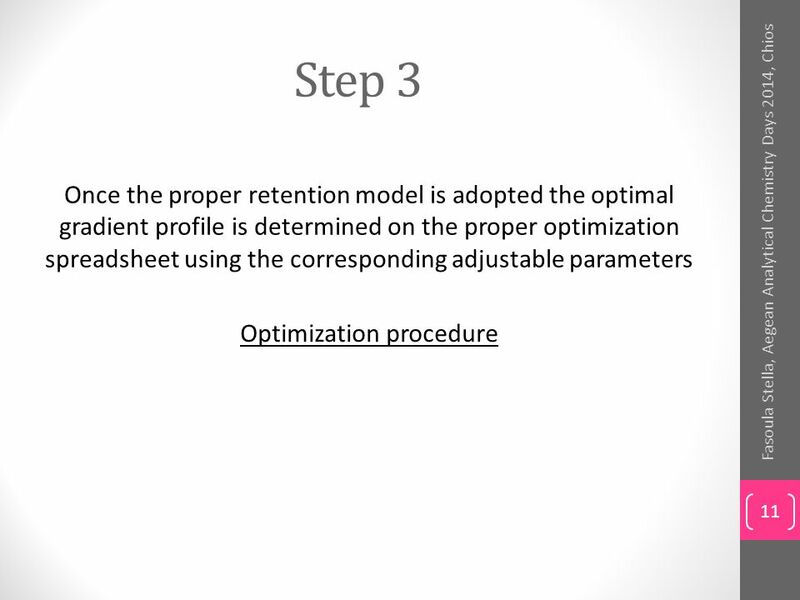 FTP Biostatistics II Model parameter estimations: Confronting models with measurements. Flowing and stationary adsorption experiment. 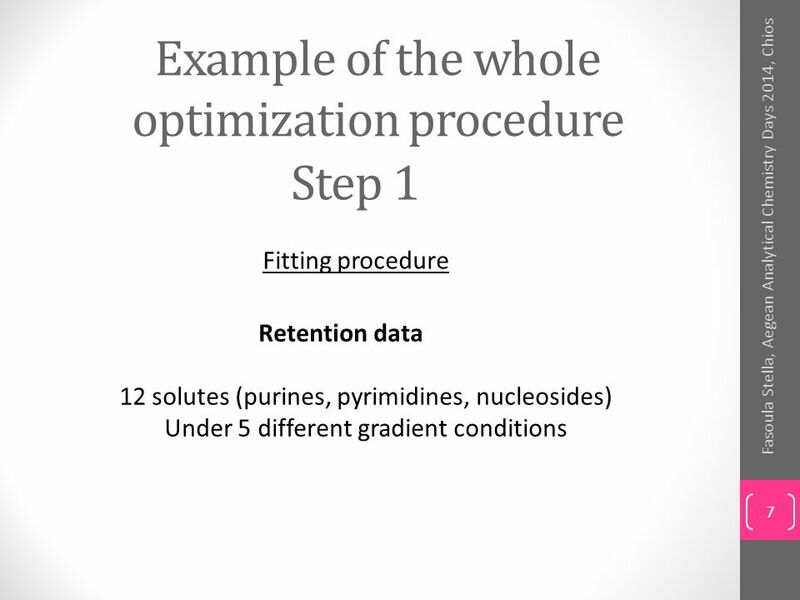 Chromatographic determination of adsorption isotherm parameters Waldemar Nowicki, Grażyna. 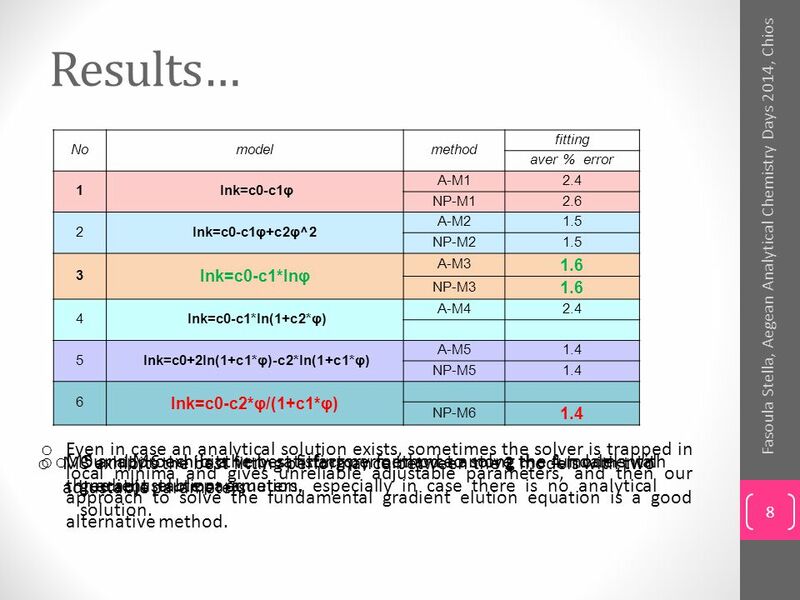 HPLC Analysis of Ionic Compounds Nicholas H. Snow Seton Hall University. 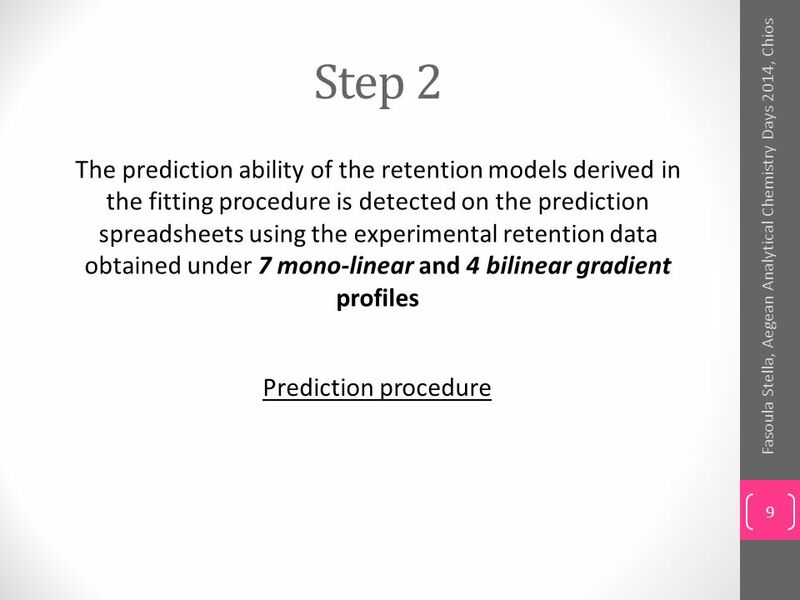 Introduction to Chromatographic Separations Due to lack of analytical specificity, separations are often necessary Chromatography is about separations. Chem. 31 – 4/15 Lecture. Announcements I Exam 2 – Hope to have graded by next Monday Lab Reports –AA report now due Monday, 4/20 (best to try to complete. 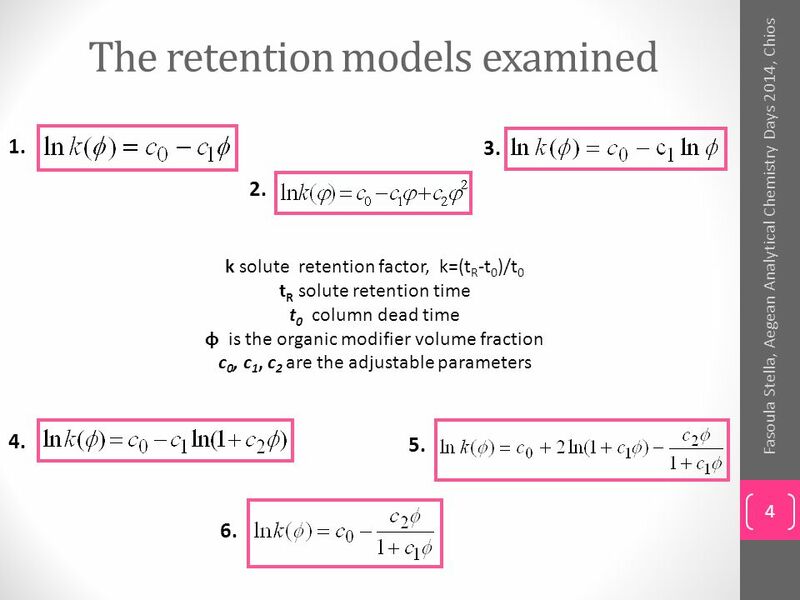 © 2007 Pearson Education Chapter 14: Solving and Analyzing Optimization Models. 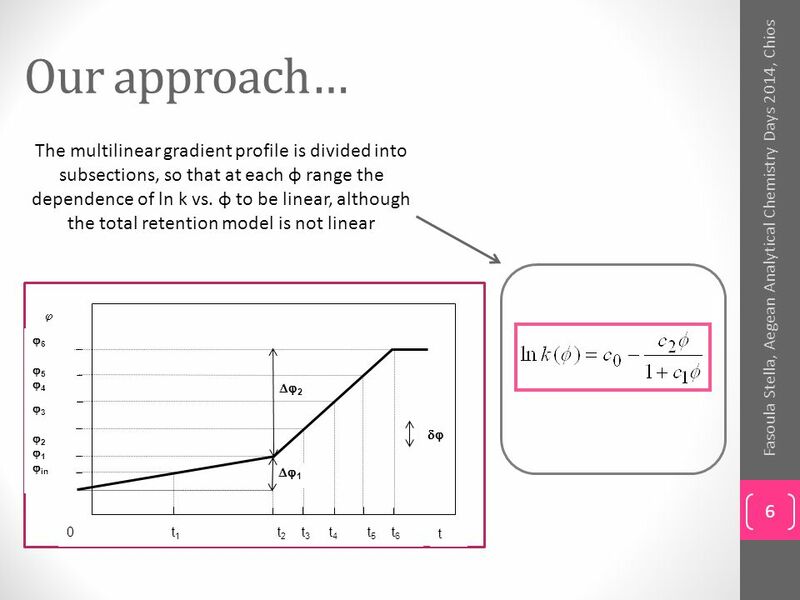 Linear functions. Mathematical Function? Relationship between two variables or quantities Represented by a table, graph, or equation Satisfies vertical. VEhicle COntrol and Navigation) An After Seismic Disaster Application VECON (VEhicle COntrol and Navigation) An After Seismic Disaster Application Laboratory.